Posted August 22, 2017 by Alec Smart & filed under City News. A newly released study by the University of NSW has confirmed that urban centres will experience intensified flooding as global temperatures rise and storms become more severe. Unless flooding is properly managed, it is expected to impact harshly upon city living. But by contrast, the countryside is drying up. Despite heightened rainfall expected with global warming, flooding in rural areas is likely to decrease. Thanks to hotter summers, increased evaporation from soils in rural areas are causing them to become drier. This means they soak up intense rainfalls when they arrive, rather than channel them to streams and river systems. The study, conducted by Professor Ashish Sharma, professor of hydrology at UNSW’s School of Civil and Environmental Engineering, and Doctor Conrad Wasko, the postdoctoral fellow at UNSW’s Water Research Centre, examined data collected from more than 43,000 rainfall stations and 5,300 river monitoring sites across 160 countries. The study warns that intense downpours will overwhelm small catchments, such as storm water drains in residential areas, where there are limited expanses of soil to capture and retain moisture. This leads to floods causing widespread destruction and threatening life. In Sydney, where a massive construction boom building high-rise apartments are bringing thousands more people to settle around waterways through historic flood zones, including the Alexandra Canal and Johnston’s Creek, current storm waters regularly back up and submerge surrounding streets. When coupled with king tides, areas such as Mill Stream and Wolli Creek around Tempe and Mascot, where rainwater feeds into the tidal Cooks River, neighbourhoods already experience localized flooding when runoff is unable to flow out into the sea. As more intense storms arrive, it will develop into potentially catastrophic deluges, washing away cars and infrastructure and weakening building foundations. “We need to adapt to this emerging reality,” said Professor Sharma. “We may need to do what was done to make previously uninhabitable places liveable; engineer catchments to ensure stable and controlled access to water. Places such as California, or much of the Netherlands thrive due to extensive civil engineering,” he said. Flood damage across the globe cost over $60 billion in 2013. This figure is expected to more than double in the next 20 years as extreme storms and rainfall intensify, along with rising sea levels and cyclones ravaging our coastlines. Approximately 40% of the world’s population of 7.5 billion people live within 100 kilometres of the sea. That amounts to 3 billion people, much of which reside in low-lying, densely populated areas, like the Ganges, Nile and Mekong river deltas, and in heavily populated cities including Bangladesh, Bangkok, Shanghai and New Orleans. Australia is the lowest continent in the world with an average elevation of only 330 metres. With around 85% of Australia’s population living in coastal zones, storm surges and rising seas will significantly impact upon our lifestyles and infrastructure. Parts of Sydney, including areas of Manly north of the entrance to Sydney Harbour, are little more than a metre above sea level. Sydney’s coast receives an average of 1,100 mm of rain annually, but it is expected to increase significantly, and sea levels will rise almost 1 metre by the end of the century, according to predictions by the Intergovernmental Panel on Climate Change in their 2007 Impacts, Adaptation and Vulnerability report. At risk of tidal inundation are Sydney’s harbour foreshores, including the CBD, and eastern beachfront suburbs, where sandy coastlines that act as buffer zones will easily wash away in powerful storms, exposing communities to the ravages of pounding waves. There are more than 70 bay and ocean beaches in Sydney metropolitan area and around its four main harbours – Port Hacking, Botany Bay, Port Jackson and Pittwater. As recently as June 2016 we witnessed nature’s destructive potential when an east coast low, bringing giant waves and king tides, eroded 50 metres of Collaroy and Narrabeen beaches, leaving a number of badly damaged waterfront properties at risk of collapsing into the sea. Back in December 2010, Ozcoasts, representing a collaborative effort of more than 100 scientists and managed by the Seabed Mapping and Coastal Information section at Geoscience Australia, released detailed data and maps forecasting suburbs at risk from climate change-driven sea-level rises. Sydney seaside suburbs facing significant danger of inundation include Manly Vale, Kurnell, Caringbah and Cromer. Properties along the Cooks and Parramatta Rivers, in Arncliffe, Marrickville, Homebush Bay, Newington and Silverwater, are also at risk during high tides from rivers breaching their banks and storm waters backing up into residential neighbourhoods. 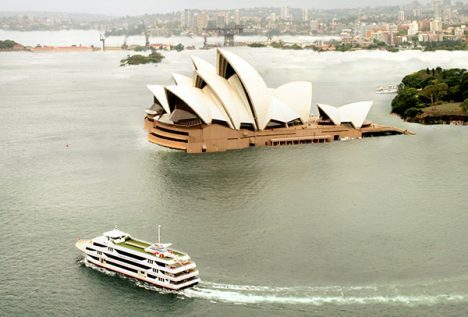 Management of this might eventually involve the construction of a Thames Barrier-type flood defence across the mouth of Sydney Harbour that allows ships to pass but can be raised and lowered depending on tidal surges. Meanwhile, the global population over the next 20 years is forecast to rise to 9 billion – requiring additional land for food production and investment in efficient irrigation of crops. This will require better management of water, especially in the rural areas where the soil is drying up through heat evaporation. The reduction in flows demonstrated by the UNSW’s study, with drier rural zones and wetter cities, makes this management of water a bigger challenge than before.